"Chateau Libido isn't one of our usual selections. Shall I unscrew it for you?" Screwcaps and cheap wine have a long association. For years, only wines of last resort had screwtops instead of corks. These wines generally could be found comfortably nestled in paper bags in the hands of…well…people who regularly drink wines of last resort. For many years, screwcaps had this unfortunate association. Oxygen is generally the #1 enemy of wine. If you've ever had the misfortune to drink from a bottle with a deteriorated cork, you know that vinegar taste well. In addition, there's a chemical compound called TCA that can form in a cork when moisture, chlorine, and mold interact. This causes a wine to taste like damp cardboard. When a wine takes on this flavor, it’s said to be “corked” – an affliction affecting about one bottle per case of imported wine, on average. Enter the "Stelvin closure." Stelvins were invented in the 1950's in France. The Stelvin is a screwtop designed specifically for use with wine bottles. Stelvins are two-piece caps that create a virtually airtight seal, thus no "corked" wine or rotting closures. They're also much more environmentally friendly, since no trees are damaged in the making of these closures. In the late 90's, Australia became the first country to use screwtops widely. Some California winemakers (most notably Bonny Doon) followed suit in the early 2000's. Some vintners now put $100+ wine in screw top bottles. The Stelvin's popularity continues to spread. About 10 percent of all wine bottled worldwide now are sealed with screwtops. Two issues prevent screwtops from becoming more widespread. First, aging. No one knows how well wine will age in a screwtop bottle. Second, romance. Many feel there's something magical to that "pop" of a freshly drawn cork. Hogue 2005 Washington State Pinot Grigio -- Hogue was one of the first large-scale U.S. winemakers to switch to Stelvins. They've always done decent, inexpensive wine -- but they grabbed a larger market share after making the twist switch. As for the wine itself, the nose is light with peach and apple scents. The body is full for a pinot grigio. It's a little acidic, but with an interesting creaminess. The finish is of decent length with a refreshing end. You could consider serving this with slightly heavier food than you might an ordinary pinot grigio. Fettucini alfredo, grilled shrimp, etc… $8-10. Twin Wells 2004 Terra Australis Reserve Shiraz: "So a Frenchman goes to Australia…" No, I don't know a punchline, and I have no idea if the winemaker is really a French expat, but this wine is as close to Europe as I've had from Australia. Since the Ozzies started this trend on a large scale, we need a wine from Down Under as an appropriate representative. The Sweet Partner in Crime gave me this wine as a blind test, and I thought I was sniffing a Cotes-du-Rhone. The nose was a little too rich and fruity for a C-d-R, but the "Old World Funk" seemed to be there. The flavor is definitely Australian Shiraz: big, dark fruits -- but with an earthier body than most. The finish is long, a little tannic, and a little tart. The price is what blew me away on this one. Found this at Trader Joe's for $7. Serve with your typical shiraz foods: grilled meats, roasted chicken, lamb, steak, and so on. Verget du Sud 2006 Rosé de Syrah -- Not even the stodgy French could resist the temptation of the Stelvin. Winemaker Jean-Marie Guffens is a traveler. He wanders France looking for small growers producing good grapes -- but doesn't limit himself to the grapes of a particular region. His wines are exclusively (to my knowledge) capped with Stelvins. This rosé is made from southern Rhone Valley Syrah. This is a "pretty smelling" rosé -- lots of flowers and pineapple. It's very nicely balanced to taste -- the fruit isn't overcome by any acidic "bite." The finish does turn tart and a little dry. The combination of acidity and full (for rosé) body would make this a winner with almost any food short of heavy beef and sauces. With anything shellfish related, especially a fish stew or paella, it brings down the house. $9-12. "How do I love thee? Let me count the ways....I know 52 of them." The Naked Vine's in Alabama! The good folks at Planet Weekly in Tuscaloosa, Alabama, are the latest to join the Vine family. I may not be able to install sauvignon blanc as the official tailgating beverage at the Iron Bowl, but I guarantee I'll find you a pairing for some Dreamland take-out. What do I mean by "expatriate wines?" Many grapes are native to a certain region or country. For the most part, grapes prefer their original terroir. Wines from a grape's native region tend to be better examples of a particular varietal, but not always. Planting a grape in a different country’s soil sometimes yields an interesting result. For example, malbec -- a humble blending grape in France -- took root in Argentina and became an excellent red on its own. Riesling, long of Germany and Alsace, takes on a very different character outside the Rhineland. Italian grapes largely don't fare well outside the confines of their motherland. Italian grapes tend to be persnickety -- requiring very specific climates and soils. Blue Fish 2005 Pinot Grigio Pfalz -- Pinot Grigio actually hails from Burgundy, where it is known as pinot gris. Much like the nomenclature of Shiraz and Syrah, winemakers tend to name their wines after the style the wine most resembles. Drier wines tend to be labeled "Pinot Grigio." Blue Fish is best known for making solid, inexpensive Riesling, but recently started experimenting with other varietals, including Pinot Grigio. The wine has a soft nose of grapefruit and honey. The wine is medium-bodied and is quite dry. There's also some tart, tropical flavor. The finish is grapefruity and of decent length for a simple wine. I'd consider it a cross between a Sauvignon Blanc and a Grüner Veltliner. A dry, acidic wine is usually refreshing and food friendly. You could have this with a risotto, with some grilled chicken, or baked swordfish. You could also sip this one by itself on a warm day. $6-7. Rancho Zabaco 2004 Sonoma Heritage Vines Zinfandel -- In Italy, the Zinfandel grape is known as Primitivo. While the lineage of this grape reaches back to somewhere in Croatia, it came into its own in Italy’s Apulia region. 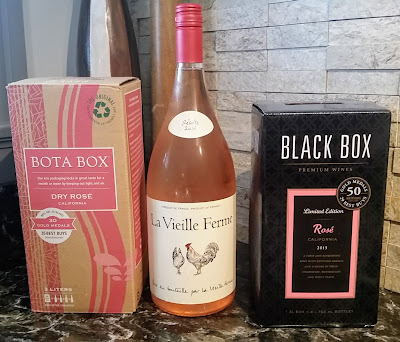 Zinfandels (and no, not white zinfandel -- we've covered that…) are often big, alcoholic wines that are made specifically to be "fruit bombs." Some of them are a little more restrained -- but you're generally not thinking "subtle" when you’re quaffing zin. I won't make any bones about it…I really enjoy this wine. Rancho Zabaco does three different, readily available zins. There's the "Dancing Bull" -- about $7-8 a bottle. There's the "Stefani Vineyard Dry Creek Valley Zinfandel," setting you back $28-30. Then you have the “Sonoma Heritage Vines.” At $12 or so, it’s a huge step up from Dancing Bull and holds its own against most other wines. Scrape your couch cushions for a few extra bits and try it. The Heritage Vines has a big nose -- sharp with blackberries and mint. The body, not unexpectedly, is big and bold with a nice balance of dark fruit and tannin. The finish is long and dry, with a nice cherry taste winding it all up. You going to put barbecue sauce on anything this summer? Get a bottle of this to go with it. Goats Do Roam 2005 "The Goatfather" -- Goats Do Roam has been a favorite value pick of mine ever since I had it for dinner a few years ago at Francesca's in Lexington, KY. The Goatfather ("Goats do roam…capice?") is a "reserve" release from this South African winery. This wine is a blend on which the winemakers claim omerta. It's a mix of traditional vinifera (Syrah, Cabernet, Merlot) and a couple of Italian varietals (Barbera, Primitivo). The result? While the nose of The Goatfather doesn't exactly conjure images of an Italian trattoria, you do get some interesting plum and licorice scents. The taste is strong and earthy. Decanting is a must. There's a surprising amount of tannin here -- it reminds me a great deal of a petit sirah with the chocolate flavors therein. The finish is long and smoky, with plenty of tannin. Like most big Italian reds, this wine would be much better paired with food than having it on its own. This would be a great match with earthy, savory foods. Sausages, ribs, stews and root vegetables would be excellent with this. You'll find it for $12-14. Similar "Super Tuscan" Italian blends will run you $20 and up. One last thought about the Sopranos -- I thought the last two episodes were some of the best television I've ever seen. As for the last scene -- yes, it was a little over the top. I never thought I'd read about the symbolic confluence of Journey lyrics, onion rings, the Latin Mass, and the difficulty of parallel parking an Audi within a single textual analysis, but it's now part of our collective memory. In one single cut to black, David Chase's series cemented its place in pop culture history, and Victoria Principal didn't even have to find James Gandolfini in her shower. The 70's. Sit back and smell the polyester. Imagine looking in the avocado-colored fridge of any groovy, shag-carpeted urban apartment. You'll find a bottle or jug of white wine -- probably either Krug or Gallo. In script on the label -- "Chenin Blanc." (The red in the cabinet above the fridge is no doubt a "Burgundy," but we've covered that…) Merlot's "Sideways" downturn pales in comparison to the utter destruction of Chenin Blanc in the U.S. for years by this marketing ploy. A shame. Chenin Blanc may have fallen from the ranks of the more popular wines -- but it's a pretty incredible grape. Chenin Blanc may be the most versatile grape on the planet. Winemakers put together everything from sparkling wine to crisp, flavorful whites to some of the best dessert wines in the world. Chenin Blanc grows almost anywhere, as well. The best Chenin Blanc is grown in the Loire Valley in France. The dessert wines from the Loire rival even Sauternes for renown. The best Chenin table wines in the Loire come from Vouvray. Chenin Blanc is the third-most cultivated grape in California and is the most widely grown grape in South Africa. Vinum Cellars 2005 "Chard-No-Way" Chenin Blanc -- Vinum Cellars was founded by a couple of buddies from UC Davis that went into the wine industry. The two of them decided to help the world rediscover this lost grape. They make their wine in Napa, in the heart of Chardonnay country -- hence the name of the wine. You start with a nose of tart apples and grapefruit. It has an extremely light body (in my mind, almost too light). However, after a quiet start, the acidity and tartness pick up along with flavors of pineapples or similar fruit. The finish is fairly long and quite tart. Vinum's creation is an ideal crisp, refreshing poolside wine. You could pair this easily with almost any light seafood or with wine killers like asparagus or artichokes. $11-14. Indaba 2005 Chenin Blanc -- South Africa is growing great amounts of Chenin Blanc, with no end in sight as the wine gains popularity worldwide. "Indaba" is Zulu for "a community discussion." This would be an appropriate beverage for any kind of social gathering to get the words flowing. The Indaba is considerably stronger in scent than the Vinum. Citrusy. The body is considerably heavier than the first, which is a good thing if you ask me. The wine is slightly sweet at first, but then gets quickly tart. If I'd not been told, I would have mistaken it for a light, complex sauvignon blanc. The finish is quite easy -- a little bit of honey and tartness. Spicy food, like satay or Thai, would go wonderfully -- as would something like pizza. Shellfish, as with most Chenins, work well. The acidity allows it to stand up to just about anything. And at $5-7, how can you go wrong? Chateau de Villeneuve 2005 Saumur -- The Saumur region of the Loire Valley is the home of the best sparkling wines made from Chenin, but their still wines are quite good as well. Among our wines this time, this one was an interesting contrast. The Saumur has an interesting "yeasty" nose, which isn't as unpleasant as it sounds. This aroma is caused by leaving the wine "sur lie" -- meaning "on the lees." "Lees" is WineSpeak for "remaining dead yeast after fermentation." Before the whole "buttery" malolactic fermentation craze began, leaving a wine on the lees was one way to make the flavor creamier. There's also a little apple on the nose. The flavor is light-bodied, with creamy flavors of pear and vanilla. The flavor is very smooth, but picks up a nice tart finish -- which would allow it to pair wonderfully with any kind of shellfish, salad, or light pasta. I baked some scallops in foil with veggies, and it was fabulous. $11-13. Until next time, bite the bullet, put the leisure suit away, and relax in the summer sun with some Chenin. Cheers!